The Tokyo firm has branched out somewhat from USB-powered neckties and facemasks to bring us the wonderfully named ‘Electric Up and Down Big TV Stand’ – essentially a platform the raises your flat-screen pride and joy to standing eye level. 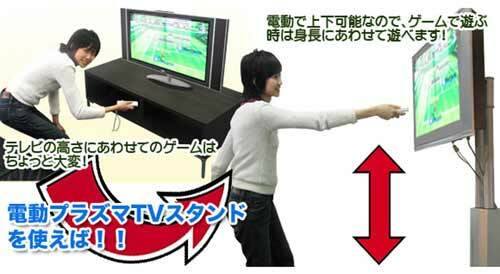 If you’re having a Wii while sitting down, then a normally elevated TV is probably fine, but should you need to stand up, then there’s a remote control for pumping the screen vertically upwards by up to 130cm. Thanko has even built in a wired controller too, although that makes the gantry look a bit like a hospital bed. Moreover, the stand is no shirker and is able to hold TVs with screens between 40 and 60 inches of up to 50kg in weight. Although looking slightly down when playing Wii tennis or golf is hardly a major problem, we like the cut of Thanko’s jib and have to give credit for doing something no sane retailer would dare attempt. Sponsored links: You can easily check out our best quality 000-118 dumps prepare you well for the real scjp certification exam. You can also get success in real exam of ccda certification with the quality mcdst questions and 642-647 answers.